A hundred years ago this week… Continuing actions and campaigns in various regions drew towards their conclusions. On the Western Front, it was the Battle Of Cambrai (November 20-December 7). Begun as a massive British tank attack, it proceeded by more orthodox means with the first wave of success subsiding into the usual back and forth. The British Army pushed forward again in the woods on Bourlon Ridge (November 27) – deploying 30 tanks rather than the 450 committed to their initial onslaught – but the following day they dug in under German artillery fire and then had to resist counterattacks on the Ridge and around Vendhuille and Loeuvres (30-December 1). Over on the Eastern Front revolutionary Russia and Germany/Austria-Hungary negotiated the war’s first major Armistice, starting with what seems to have been a semi-official “suspension of hostilities” (December 2). It would take some time to extend along the whole Front, as evidenced by a substantial battle in Moldavia (November 29). Having stopped their long retreat resulting from defeat by Austria-Hungary (with German support) at the Battle Of Caporetto in late October, with increasing confidence the Italian Army held the line from the River Piave estuary (just east of Venice) north to Monte Grappa, repulsing an assault in the Brenta Valley (November 26) and generally benfiting from the invaders’ overstretched supply systems. While the Balkans situation remained fairly static, the Austrian Army did take a swing at Italian positions near Aviona, Albania, and the British and French advanced against the Bulgarians again in the Doiran region north of Monastir, Macedonia, where they’d fought a major battle in late 1916. The Battle Of Jerusalem (November 17-December 30) saw significant developments as Ottoman troops broke out of the city to attack the Egyptian Expeditionary Force (British, Anzac and Indian) at Nebi Samwell, the Zeitun Plateau, Beit Ur el Tahta and El Buri (November 27-December 1). At first, the Ottomans gained ground, but then suffered so many casualties it undermined their defensive efforts later in the month. Finally, the decisive moment in the lengthy Allied campaign to take German East Africa – a force of 3,500 Germans and Africans surrendered at Nevale (November 27) and a few days later (December 1) the final active German force under General von Lettow-Vorbeck crossed the Rovuma river border, leaving German East Africa – while “invading” Portuguese Empire territory after a fashion. 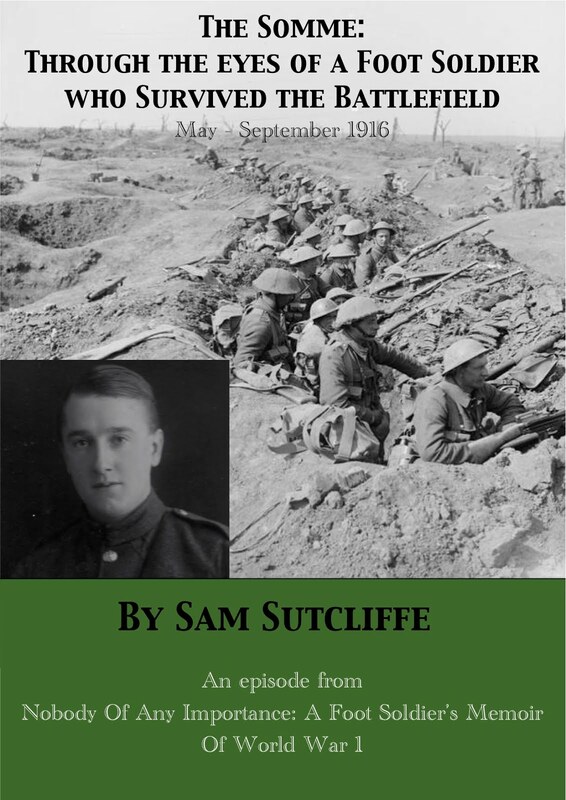 Last week, Sam began his final home leave before returning to the Western Front after his “year out” through being underage. He enjoyed the glorious mundanity of helping his previously poor family move a little way up in the world, renting a larger, semi-detached house in Edmonton. 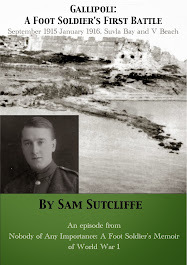 With a will, he carried furniture, laid lino and diverted his thoughts and imagination from what, as a Gallipoli/Somme veteran, he knew awaited him over in France. 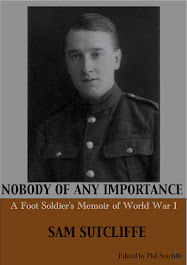 ‘I don’t suppose it was the successful job on the linoleum that made me feel, at this point in the war, I had, at last, become an adult, and should attempt some sort of summing-up. The immediate future had to be thought about and discussed. In late 1917, everybody knew the Germans were making obvious preparations for one final massive attack** which they hoped would place the French Channel coastline in their hands and compel the Allies to surrender or, eventually, contend with a German invasion of Britain. ** Gregory Blaxland’s Amiens, 1918 (1968), published by W. H. Allen, says that at a meeting of the German Chiefs of Staff November 11, 1917, General Erich Ludendorff decided to prepare the Kaiserschlacht (Kaiser’s Battle) – dubbed “The Spring Offensive” by the Allies. A few years later he emerged as a fervent anti-semitic supporter of Hitler… although he was also anti-Christian and anti-capitalist… while believing that if Germany lost the war the people would become “slaves of international capital” By the ‘30s he had turned against Hitler. *** In fact, my father had spent two months or more of his “year out” in Sheffield hospitals beating off severe illnesses – first as a carrier of, though as it turned out not a sufferer from cerebro-spinal meningitis, then through catching a severe dose of German measles, and finally, during the summer of 1917, tackling chronic gastro-enteritis which his doctor diagnosed as clearly an effect of the terrible dietary and sanitary conditions he’d endured in the trenches of Gallipoli (1915-16) and the Somme (1916). 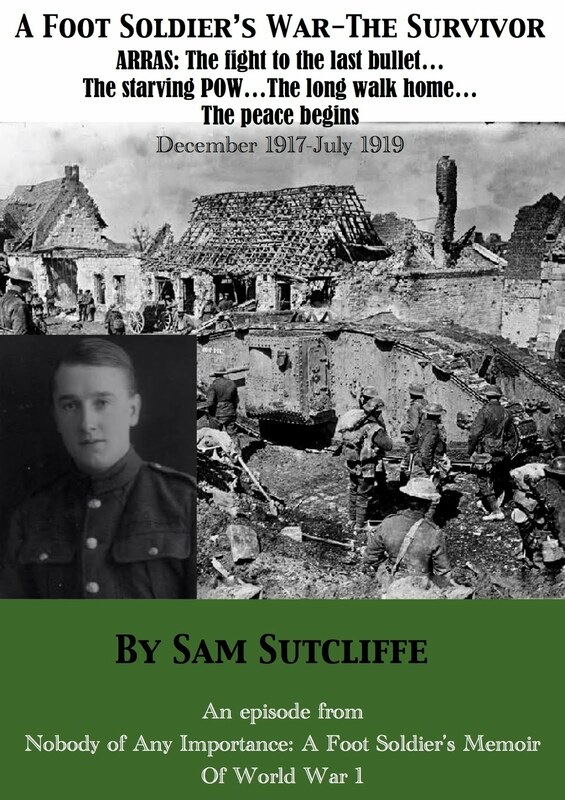 December, 1917, Sam’s 19 now and it’s his last home leave before returning to the Western Front… His final preparation? Laying lino! A hundred years ago this week… The Battle Of Cambrai began (November 20-December 7) with a British onslaught by 450 tanks. On the first day this worked very well as they took the villages of Ribécourt and Marcoing and, 24 hours on, occupied Fontaine Notre Dame, 2.5 miles from Cambrai. But on the second day half the tanks were hors de combat with damage or “mechanicals” and the German Army held on to key British objectives Flesquières and Bourlan Wood (scene of to-and-from fighting November 23-5), then recaptured Fontaine Notre Dame (22). In Italy, the long retreat under fierce attack from Austrian and German troops proved to have reached a firm conclusion with the Italian Army under their new commander Diaz holding still relentless attacks along the River Piave (estuary just east of Venice) and further north at the First Battle Of Monet Grappa (November 13-25, evolved from the 12th Battle Of The Isonzo; casualties Austro-Hungarian/German 21,000, Italian 12,000). Over In Palestine, the Battle Of Jerusalem (November 17-December 30) went through a phase known as the Battle Of Nebi Samwill (November 17-24). The British section of the Allies’ Egyptian Expeditionary Force tried to break into Jerusalem via an attack from the north, but stalled 5 miles out after taking Nebi Samwill village – Ottoman Army resistance proved too strong and the British infantry lacked support. Finally, a new development in southern Africa – while the Allied effort to drive Germany out of their East African colony (now Tanzania, Rwanda and Burundi) proceeded a cross that vast territory, the German Army found a new way to sustain their resistance. They attacked Portuguese East Africa, initially winning the Battle Of Ngomo (November 25) and achieving their real objective – not conquest but capturing supplies (250,000 rounds, hundreds of rifles; a lot more to come from further incursions). Last week, my father described how the Army prepared him for a return to the Western Front after his year out – a thorough refresher course in his specialism as a Signaller conducted at the large and near-luxurious Army camp outside Crowborough, Sussex. Among the evening entertainments, local resident Sir Arthur Conan Doyle, Sherlock Holmes’s creator and a WW1 historian, delivered a lecture on the Somme – which Sam regarded with a veteran’s ambivalence (not realising the depth of the writer’s engagement, his son having suffered fatal wounds there). Now Sam enjoys his final home leave before travelling to France. He spends much of it helping the family move into a much better rented house than the rather grim terrace where they’d lived for most of the years since 1902 when the “ruin” of his father’s family business drove them from Manchester to London and from prosperity to poverty. My father refrains from doing the arithmetic here, but the family’s improved circumstances during the war arose from two things, a) his father’s steady promotion in the export company where he’d found a job that lasted (see Blog 174, November 5, 2017, when Sam visited his workplace), and b) Sam and his brother Ted had, since 1915, taken up the Government’s offer that if a serviceman agreed to have a percentage of his pay sent directly to his family then they would also receive a substantial supplement from the state – i.e. for the Sutcliffes, extra income for the duration and two less mouths to feed. ‘At home on leave for some days, I found myself busy from morning to night helping the family move from our three-bedroom terrace house into a three-floored, semi-detached**. As I carried furniture and other items back and forth I got my first look at our new home, starting with several treks upstairs: on the first floor a large and a small bedroom, a really big front room which Ma intended to let furnished as a bed-sitting room, and a bathroom at the top of the first flight of stairs with a WC; above that front room another, equally large, and another room off with an adjoining large cupboard or closet quite as big as many single bedrooms. At ground level we had a front dining room and back breakfast room, the latter with French windows through which we saw a paved yard and a long, wide garden. A passage from the hall led alongside the staircase to the kitchen with its roomy cooking range and a garden. Most of the windows, including the French windows, had strong, wooden, folding shutters which, when closed and secured by their iron-bar fastenings, looked quite burglar-proof. It all suggested that, even in those “good old days”, folks had need of night-time protection against intruders. Beyond the kitchen was what we called – perhaps because of our North-Country origins – a scullery, furnished with a gas cooker, a large sink, a coal-fired boiler (a “copper” to us) and, high above, a big water-storage tank. Another door led to a second WC and a further door opened into a large coal shed. Under cover of a glazed roof, a long passageway led to a tile-covered garage whose big, wooden doors opened on to a drive and a modest front garden protected from the busy main road by a privet hedge and iron-barred gates. The back garden could be approached from the French windows, the scullery or from the coal shed. A well-stocked border flowerbed with a greengage tree, a large apricot tree, and several apple trees, stretched its entire length. While one would step out of the house on to a small lawn, bordered on the far side by an old wall, the grass soon gave way to an area containing more well-spaced fruit trees, mainly varieties of apple, under which grew gooseberry and currant bushes – then, further down, large flower and vegetable beds, and another grassy patch towered over by two immense trees, one a winter pear, the other a rarity indeed, a mulberry (its trunk must have been 30 inches in diameter). A railing of tall iron spikes across the far end must have deterred many a local lad from scrumping. I give all this detailed information so that you can appreciate the impressive difference from the small terrace house we had left — and the extent of Ma’s self-confidence in believing she could add to her husband’s income sufficient money to cover higher rent plus the rates and some costs of upkeep. ** They moved to 317, Fore Street, Edmonton, from 26 Lowdon Road.